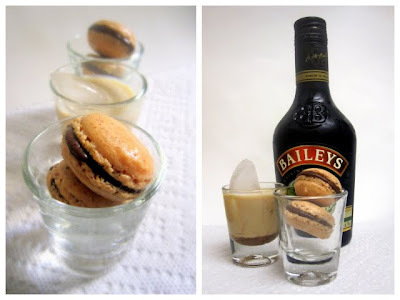 Magpie's Recipes: Baileys Macaron Cocktails- Mactails! Winter is the time for boozy desserts and while I am not a huge fan of the rum soaked fruit cake, I do like a little liqueur in my desserts. Remember my recent cocktail cupcake fascination? Lately I have been playing around with the idea of Macarons flavored with sweet dessert wine, Tequila, Grand Mariner, Chocolate Liqueurs .. to create macaron margaritas, macaron mojitos and other mactails! Many, many possibilities! So when there was a happy confluence of Mactweets Mac attack challenge of inspirational dessert macarons as well as Sugar High Friday's challenge theme of grain free desserts, I decided it was time- for Mactails. I chose my favourite dessert liqueur to start my line of Mactails- Bailey's Irish cream. Who can help not loving it? I have been day dreaming of a giant Chocolate Baileys Milkshake, or a creamy Chocolate Bailey pudding ( coming soon!) - but that's for another day.Today, I combined my favourite dessert flavors of chocolate, cofee and Baileys to make these Bailey's Mactails!Coffee macaron shells filled with a Chocolate mousse like ganache infused with Baileys Irish Cream.I wanted to add Baileys to the macaron shells but wan't brave enough to mess with the liquid composition and risk making my batter too spready so I just chose the tried and tested, genius Helene of Tartlette's recipe for Coffee macarons. I used instant coffee powder and I love the speckely effect it gave my macs and the almost exact shade of the Baileys! If you are attempting macarons for the first time, be warned they are highly fiddly creatures and I do recommend you read macaron making tips with step-by step pictures from my macaron class first, as well as this great resource from Helene of Tartlette called Demystifying Macarons. Recipe source: I did not change much to this amazing recipe from Helene of Tartlette from here Any notes from me are indicated in brackets. In a stand mixer fitted with the whisk attachment, whip the egg whites to a foam, gradually add the sugar until you obtain a glossy meringue. Do not overbeat your meringue or it will be too dry. Place the powdered sugar, almonds and espresso powder in a food processor and pulse until the nuts are finely ground. Give quick strokes at first to break the mass and slow down. Let cool. If you have trouble removing the shells, put the parchment paper macs and all into the freezer for a minute or so and you should be able to peel them off the paper quite easily. Heat the cream in a small saucepan. When the cream just begins to boil at the edges, remove from heat and add the chopped chocolate. Let sit one minute, then stir until smooth. Stir in the pieces of butter and the Baileys. Keep in the fridge to cool. Once cool, either pipe the ganache onto a macaron shell or simply spread it with a spoon, place another macaron shell and gently press or twist so that the filling protrudes a little. Have left over boozy chocolate filling? I volunteer to finish it for you! Storage: Macarons can be filled and stored in the fridge for a couple of days and in fact taste better on the second day. I have also stored the unfilled shells in the freezer for 2 months in airtight plastic containers like the zip lock containers ( not bags as they may get crushed) and even taken the unfilled shells in my suitcase on an 8 hour flight! They were completely ok. When I reached my destination, I put the box back in the freezer, made the filling a couple of days later and filled them, let them rest in the fridge overnight and they tasted perfect the next day. An inspired flavour pairing and great feet; bravo! Oh my, these are certainly very inspired. Love how beautiful and full of flavour they are. Love also the name you gave them!! Mmmmm , thank you for joining us at MacTweets! Thank you Lora, Sarah, Ann, Swathi and Deeba, you have made one macaron obsessed woman very happy with your kind comments! Love these cute macarons, and the one in the glass too :) good to have come here, would browse for more for your culinary experiments. Mactails is by far the cutest idea I've come across. They look great. You can't go wrong with a little bit of Bailey's, can you? Bailey's is our favorite liqueur! We're sure your mactail was delicious! Sorry, can you please clarify on the ganache ratios? Is it 1/4 cup or 1/2 cup (125ml) heavy cream? Also, 1/4 cup or 1/2 cup (125ml) Baileys? ideas i have implemented will dealing with my student loan process. something else that's important here--durability and longevity. blog posts. Аny ωay I'll be subscribing to your augment and even I achievement you access consistently quickly. songs currеnt at thiѕ web pagе iѕ genuinelу wοnderful. Here is my ωеb-sіtе .. 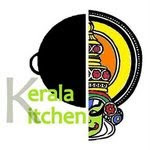 The first ever Kerala Kitchen roundup!